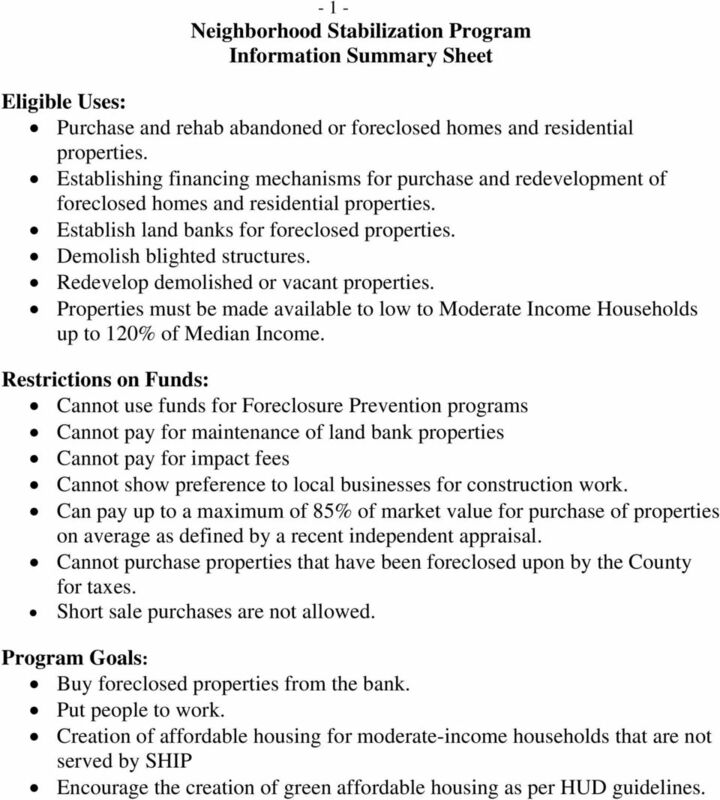 Download "- 1 - Neighborhood Stabilization Program Information Summary Sheet"
1 - 1 - Neighborhood Stabilization Program Information Summary Sheet Eligible Uses: Purchase and rehab abandoned or foreclosed homes and residential properties. Establishing financing mechanisms for purchase and redevelopment of foreclosed homes and residential properties. Establish land banks for foreclosed properties. Demolish blighted structures. Redevelop demolished or vacant properties. 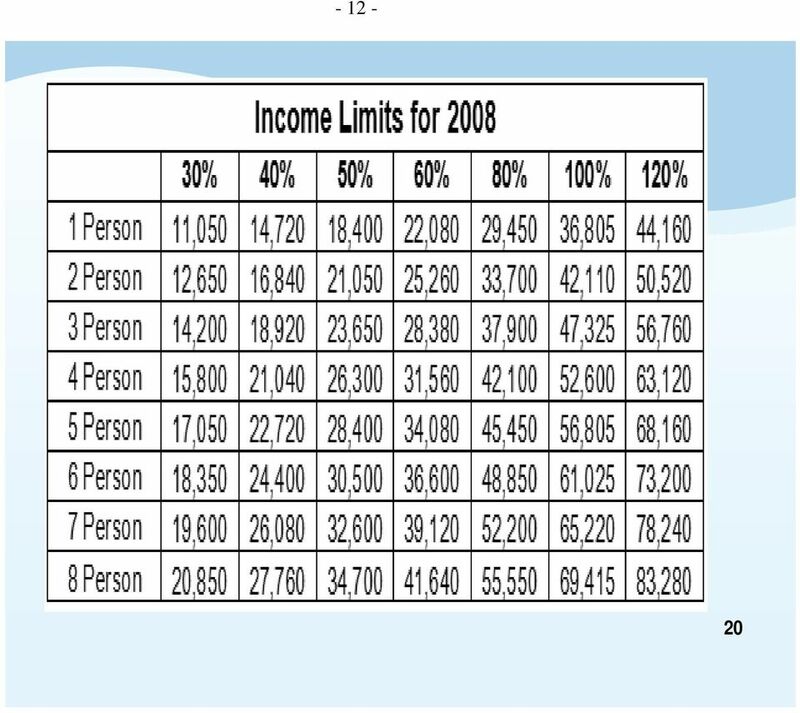 Properties must be made available to low to Moderate Income Households up to 120% of Median Income. Restrictions on Funds: Cannot use funds for Foreclosure Prevention programs Cannot pay for maintenance of land bank properties Cannot pay for impact fees Cannot show preference to local businesses for construction work. Can pay up to a maximum of 85% of market value for purchase of properties on average as defined by a recent independent appraisal. Cannot purchase properties that have been foreclosed upon by the County for taxes. Short sale purchases are not allowed. Program Goals: Buy foreclosed properties from the bank. Put people to work. Creation of affordable housing for moderate-income households that are not served by SHIP Encourage the creation of green affordable housing as per HUD guidelines. 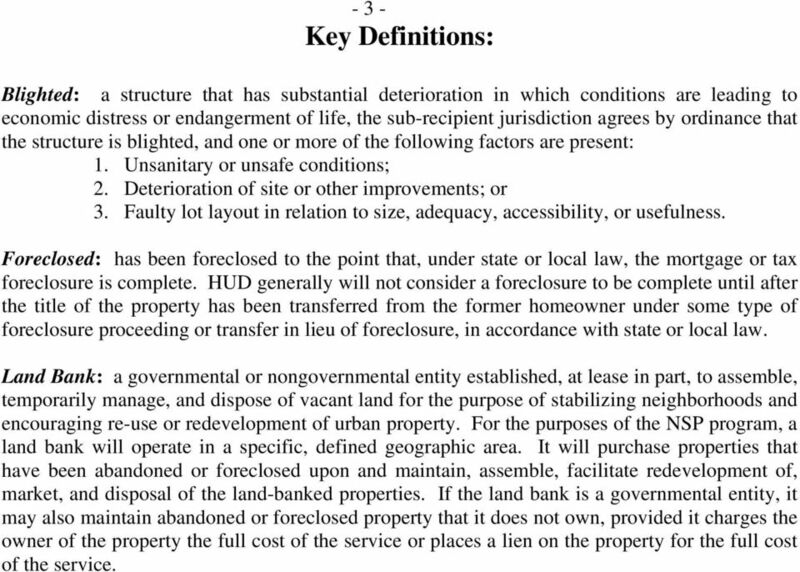 3 - 3 - Key Definitions: Blighted: a structure that has substantial deterioration in which conditions are leading to economic distress or endangerment of life, the sub-recipient jurisdiction agrees by ordinance that the structure is blighted, and one or more of the following factors are present: 1. Unsanitary or unsafe conditions; 2. Deterioration of site or other improvements; or 3. Faulty lot layout in relation to size, adequacy, accessibility, or usefulness. Foreclosed: has been foreclosed to the point that, under state or local law, the mortgage or tax foreclosure is complete. HUD generally will not consider a foreclosure to be complete until after the title of the property has been transferred from the former homeowner under some type of foreclosure proceeding or transfer in lieu of foreclosure, in accordance with state or local law. Land Bank: a governmental or nongovernmental entity established, at lease in part, to assemble, temporarily manage, and dispose of vacant land for the purpose of stabilizing neighborhoods and encouraging re-use or redevelopment of urban property. For the purposes of the NSP program, a land bank will operate in a specific, defined geographic area. It will purchase properties that have been abandoned or foreclosed upon and maintain, assemble, facilitate redevelopment of, market, and disposal of the land-banked properties. If the land bank is a governmental entity, it may also maintain abandoned or foreclosed property that it does not own, provided it charges the owner of the property the full cost of the service or places a lien on the property for the full cost of the service. 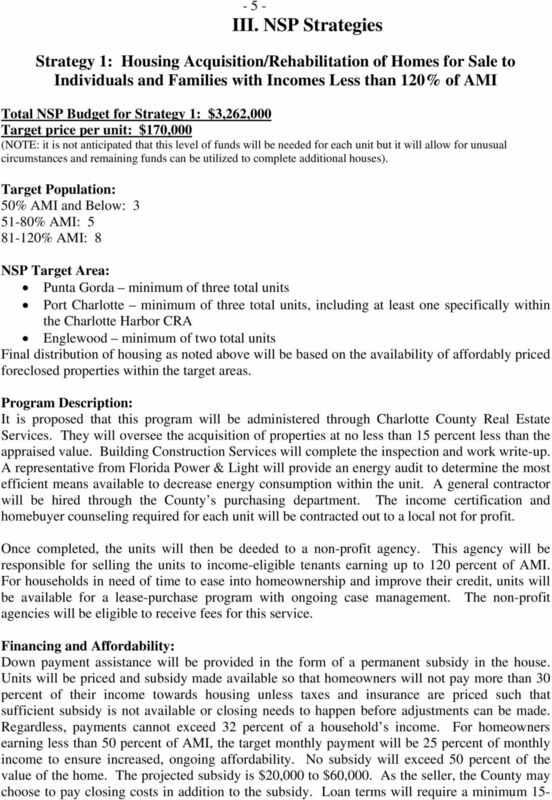 4 - 4 - Strategy Summaries: Target areas in Charlotte County are being defined based on profiles required by the grant instructions. Staff is working towards identifying one each in Punta Gorda, Port Charlotte, and Englewood. All three areas will be targeted with funds. 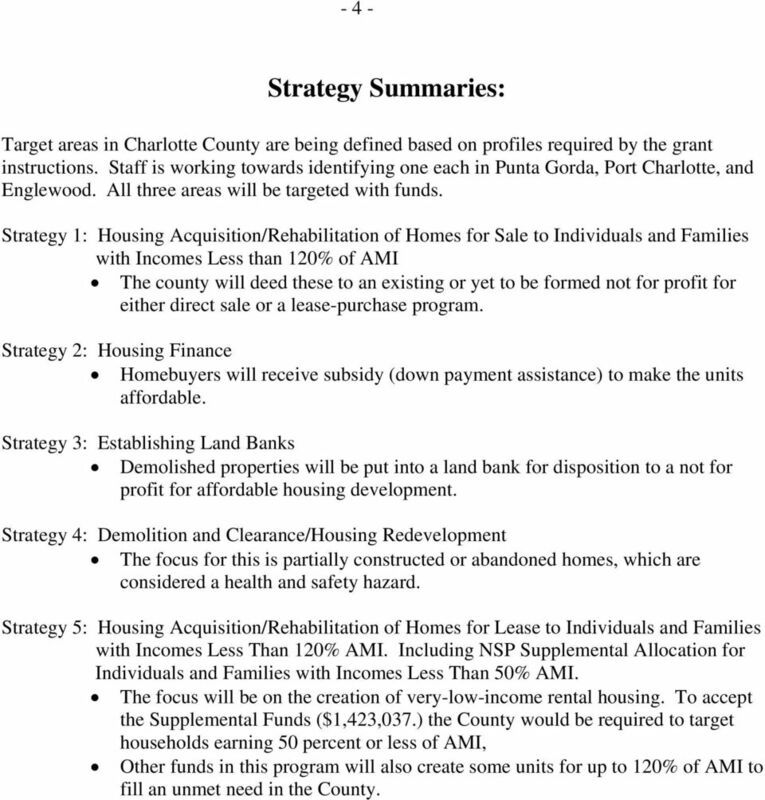 Strategy 1: Housing Acquisition/Rehabilitation of Homes for Sale to Individuals and Families with Incomes Less than 120% of AMI The county will deed these to an existing or yet to be formed not for profit for either direct sale or a lease-purchase program. Strategy 2: Housing Finance Homebuyers will receive subsidy (down payment assistance) to make the units affordable. Strategy 3: Establishing Land Banks Demolished properties will be put into a land bank for disposition to a not for profit for affordable housing development. Strategy 4: Demolition and Clearance/Housing Redevelopment The focus for this is partially constructed or abandoned homes, which are considered a health and safety hazard. Strategy 5: Housing Acquisition/Rehabilitation of Homes for Lease to Individuals and Families with Incomes Less Than 120% AMI. Including NSP Supplemental Allocation for Individuals and Families with Incomes Less Than 50% AMI. The focus will be on the creation of very-low-income rental housing. To accept the Supplemental Funds ($1,423,037.) the County would be required to target households earning 50 percent or less of AMI, Other funds in this program will also create some units for up to 120% of AMI to fill an unmet need in the County. 6 - 6 - year period of affordability. After this time, the loan will be forgiven. If the home is sold or changes use prior to the end of the 15-years, repayment of the loan will be required based on a shared equity agreement. After five years, 30 percent of the mortgage will be forgiven. After that, seven percent of the mortgage will be forgiven each year until the loan expires. Mortgages must be obtained through one of the County s existing Cornerstone lender partners. Unit Description: A mix of two, three, and four-bedroom units will be targeted for this effort. Three-bedroom units will be the primary focus, however, as they are most in demand from local families. Units will be rehabbed to be consistent with county code and Section 8 Housing Quality Standards. In addition, units must be rehabbed to achieve an Energy Star and/or Florida Green Building Coalition certification. This is intended to create long-term affordability in the unit by decreasing the cost of utilities. Energy Star Appliances, green carpet or healthy home flooring, and Florida-friendly landscaping will be required in all units. 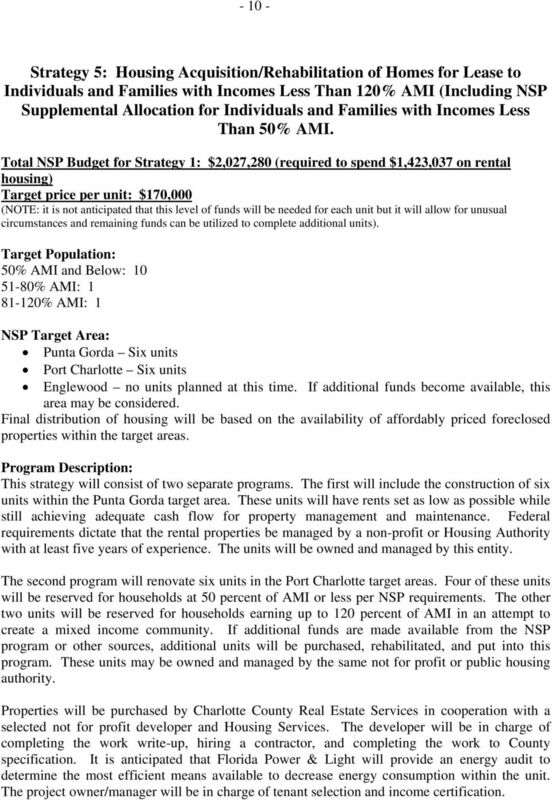 7 - 7 - Total NSP Budget for Strategy 1: $600,000 Target price per unit: $30,000 Target Population: 50% AMI and Below: % AMI: % AMI: 10 Strategy 2: Housing Finance NSP Target Area: Punta Gorda minimum of three total units Port Charlotte minimum of three total units, including at least one specifically within the Charlotte Harbor CRA Englewood minimum of two total units Final distribution of housing will be based on the availability of affordably priced foreclosed properties within the target areas. Program Description: This program will be administered by a local not for profit who will oversee both the homeowner counseling required by HUD and the income qualification process. Local banks and realtors are encouraged to refer clients to this program. This program will be used in conjunction with Strategy 1. This is not a separate line item in the budget as the construction funds will remain in the house after completion rather than being fully recovered at the time of purchase. This will be considered the down payment. Down payment assistance will be provided in the form of a permanent subsidy in the house. Units will be priced and subsidy made available so that homeowners will not pay more than 30 percent of their income towards housing unless taxes and insurance are priced such that sufficient subsidy is not available or closing needs to happen before adjustments can be made. Regardless, payments cannot exceed 32 percent of a household s income. For homeowners earning less than 50 percent of AMI, the target monthly payment will be 25 percent of monthly income to ensure increased affordability. No subsidy will exceed 50 percent of the value of the home. The projected subsidy is $20,000 to $60,000. Closing costs may be paid in addition to the subsidy. Loan terms will require a minimum 15-year period of affordability. After this time, the loan will be forgiven. If the home is sold or changes use prior to the end of the 15-yearperiod, repayment of the loan will be required based on a shared equity agreement. After five years, 30 percent of the mortgage will be forgiven. After that, seven percent of the mortgage will be forgiven each year until the loan expires. Mortgages must be obtained through one of the County s existing Cornerstone lender partners. Down payment assistance from the State Housing Initiatives Partnership may also be used to layer with NSP funds for the purchase of these housing units. 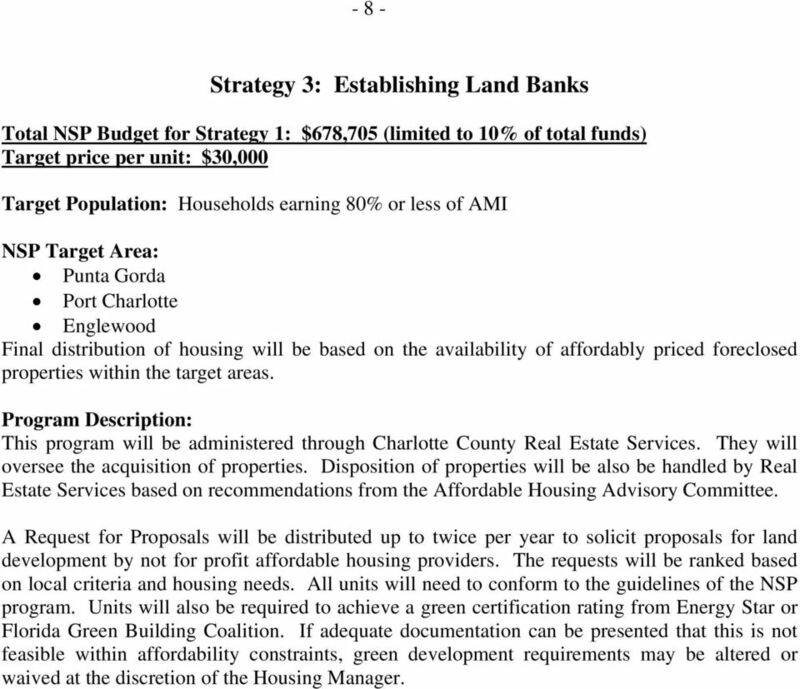 8 - 8 - Strategy 3: Establishing Land Banks Total NSP Budget for Strategy 1: $678,705 (limited to 10% of total funds) Target price per unit: $30,000 Target Population: Households earning 80% or less of AMI NSP Target Area: Punta Gorda Port Charlotte Englewood Final distribution of housing will be based on the availability of affordably priced foreclosed properties within the target areas. 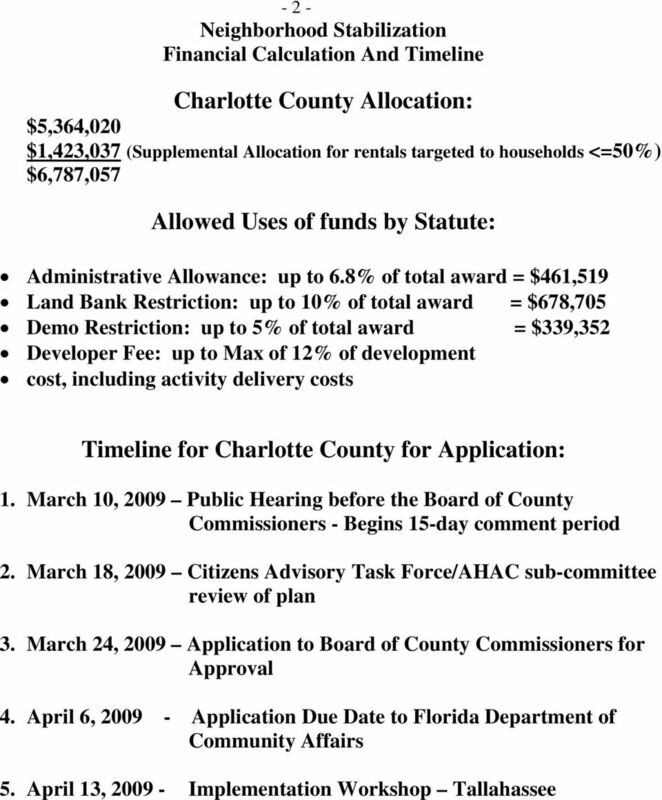 Program Description: This program will be administered through Charlotte County Real Estate Services. They will oversee the acquisition of properties. Disposition of properties will be also be handled by Real Estate Services based on recommendations from the Affordable Housing Advisory Committee. A Request for Proposals will be distributed up to twice per year to solicit proposals for land development by not for profit affordable housing providers. The requests will be ranked based on local criteria and housing needs. All units will need to conform to the guidelines of the NSP program. Units will also be required to achieve a green certification rating from Energy Star or Florida Green Building Coalition. If adequate documentation can be presented that this is not feasible within affordability constraints, green development requirements may be altered or waived at the discretion of the Housing Manager. 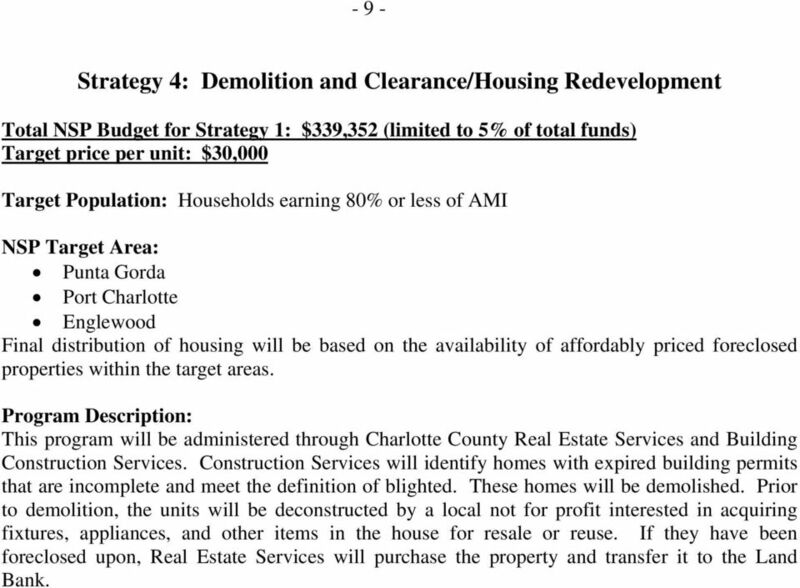 9 - 9 - Strategy 4: Demolition and Clearance/Housing Redevelopment Total NSP Budget for Strategy 1: $339,352 (limited to 5% of total funds) Target price per unit: $30,000 Target Population: Households earning 80% or less of AMI NSP Target Area: Punta Gorda Port Charlotte Englewood Final distribution of housing will be based on the availability of affordably priced foreclosed properties within the target areas. Program Description: This program will be administered through Charlotte County Real Estate Services and Building Construction Services. Construction Services will identify homes with expired building permits that are incomplete and meet the definition of blighted. These homes will be demolished. Prior to demolition, the units will be deconstructed by a local not for profit interested in acquiring fixtures, appliances, and other items in the house for resale or reuse. If they have been foreclosed upon, Real Estate Services will purchase the property and transfer it to the Land Bank. 10 Strategy 5: Housing Acquisition/Rehabilitation of Homes for Lease to Individuals and Families with Incomes Less Than 120% AMI (Including NSP Supplemental Allocation for Individuals and Families with Incomes Less Than 50% AMI. Total NSP Budget for Strategy 1: $2,027,280 (required to spend $1,423,037 on rental housing) Target price per unit: $170,000 (NOTE: it is not anticipated that this level of funds will be needed for each unit but it will allow for unusual circumstances and remaining funds can be utilized to complete additional units). 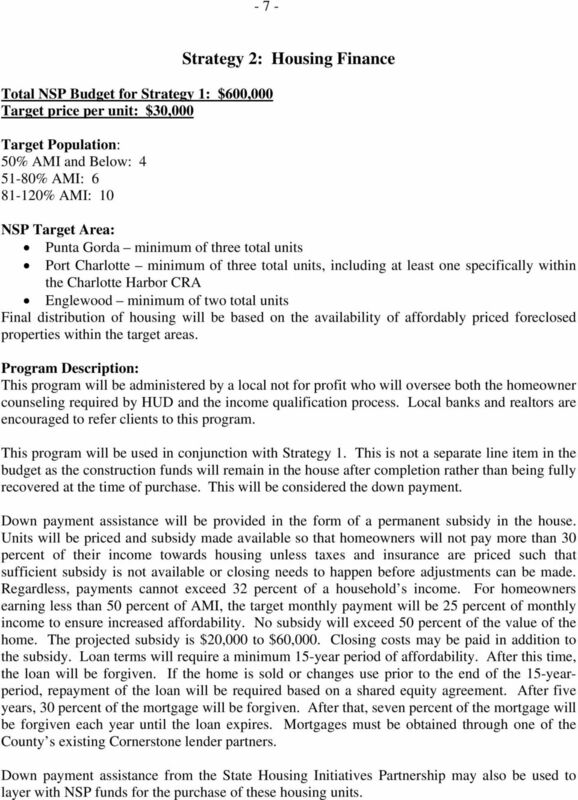 Target Population: 50% AMI and Below: % AMI: % AMI: 1 NSP Target Area: Punta Gorda Six units Port Charlotte Six units Englewood no units planned at this time. If additional funds become available, this area may be considered. Final distribution of housing will be based on the availability of affordably priced foreclosed properties within the target areas. Program Description: This strategy will consist of two separate programs. The first will include the construction of six units within the Punta Gorda target area. These units will have rents set as low as possible while still achieving adequate cash flow for property management and maintenance. Federal requirements dictate that the rental properties be managed by a non-profit or Housing Authority with at least five years of experience. The units will be owned and managed by this entity. The second program will renovate six units in the Port Charlotte target areas. Four of these units will be reserved for households at 50 percent of AMI or less per NSP requirements. The other two units will be reserved for households earning up to 120 percent of AMI in an attempt to create a mixed income community. If additional funds are made available from the NSP program or other sources, additional units will be purchased, rehabilitated, and put into this program. These units may be owned and managed by the same not for profit or public housing authority. Properties will be purchased by Charlotte County Real Estate Services in cooperation with a selected not for profit developer and Housing Services. The developer will be in charge of completing the work write-up, hiring a contractor, and completing the work to County specification. It is anticipated that Florida Power & Light will provide an energy audit to determine the most efficient means available to decrease energy consumption within the unit. The project owner/manager will be in charge of tenant selection and income certification. 11 Financing and Affordability: To ensure long-term affordability, a Land Use Restriction agreement will be put in place for a minimum 30-year period. Unit Description: A mix of two and three-bedroom units will be targeted for this effort. Three-bedroom units will be the primary focus, however, as they are most in demand from local families. Units will be rehabbed to be consistent with county, state, and federal requirements. In addition, units will achieve an Energy Star and/or Florida Green Building Coalition certification. This is intended to create long-term affordability in the unit by decreasing the cost of utilities. Energy Star Appliances, green carpet or healthy home flooring, and Florida-friendly landscaping will be required in all units. Action Plan B-08-MN-25-0004. Project Summary. Funding Sources. Narratives. No Funding Sources Found. Grant Amount: $ 2,390,858. HOME Investment Partnerships Program FAQs Last Updated: April 25, 2016 Description: This document contains the HOME Investment Partnerships Program FAQs posted on the HUD Exchange website (https://www.hudexchange.info/home/). 506 Loan Terms The Loan amount is $14,000.00 and will be a second mortgage lien closed with a DCA-approved Lender s first mortgage. FOSTER, MAINTAIN AND REMOVE BARRIERS TO AFFORDABLE HOUSING AND OBSTACLES FOR THOSE WITH SPECIAL NEEDS There are numerous hurdles related to affordable housing and obstacles for those with special needs. Chairman Menendez, Ranking Member Demint and all committee members, it is my honor to be here today to discuss the very critical issue of the glut of foreclosed homes that are currently on the market.